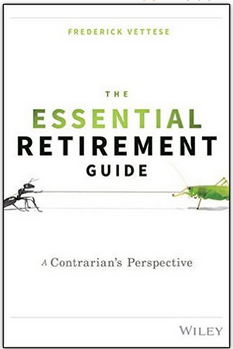 This book (available here on Amazon) makes a valuable contribution to the individual investor's bookshelf. It has some unique content on some extremely important topics like the frequency of health problems and their potential costs during retirement. It also provides a lot of common sense on the issues of how and how much to save for retirement, including the old bugbear rule of thumb on what percentage of working age income one should aim to replace in retirement. the 70% income replacement target is far too high for most people, especially the middle income earners who are constantly being hectored to save more to stave off retirement disaster; author Vettese makes a pretty good case too, showing with examples how major portions of pre-retirement expenses usually go away, such as mortgage payments, child raising expenses and retirement saving itself; instead he says, reasonable targets that maintain lifestyle are often closer to 50%; he usefully provides enough detail to allow readers to figure in variations for their own circumstances. retiree spending declines with age, and at an accelerating pace, after age 70 or so, such that maintaining an inflation-adjusted constant real return overdoes the need; furthermore, he cites sources explaining that this decline is due to falling interest and capability to spend; thus, he believes that inflation at the government's 2% target rate is not as serious an issue as commonly stated. buying an annuity, which only a tiny minority of retirees actually do, is a wise move to counter the risk of out-living your money if you do not have a defined benefit pension plan, which fewer and fewer people do. How long will you live and how much of that will you likely be healthy? What are the most threatening health problems or diseases during retirement and how likely is it you will need to go into Long Term Care (LTC)? What is the cost of LTC and what are the odds for average years in LTC and worst case? 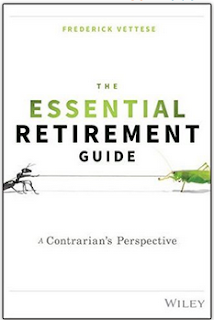 Ironically, given the fact that Vettese is an actuary, the weak part of the book is the treatment of investing leading to and during retirement. Probably this is the result of the book's aim to address both Canadian and US audiences. There is mention of, but no in-depth discussion of types of accounts like RRSPs, TFSAs or the appropriate types of investments for each account and how this should change after retirement except the sound, but general, advice to buy annuities. Chapter 17 confusingly misconstrues the 4% withdrawal rule, ignoring the original formulation by William Bengen as a constant real (inflation-adjusted) annual withdrawal based on the portfolio value at retirement. Vettese instead states it as 4% of the remaining annual balance. The effect of Vettese's version of the rule is of course that you will never run out of money. Mathematically, taking any percentage less than 100% out of a portfolio will always leave something though at higher percentages the remainder gets awfully small. Even at lower percentages like 4, 5, 6% you will face quite significant reductions in spending in larger down market years, which goes against the objective to maintain lifestyle spending. There is also no discussion of the dangers of poor investment returns early in retirement, termed sequence of returns risk. This is a critical risk (see this simplified example of how much sequence of returns can influence outcomes), one that finance professor and pensions expert Moshe Milevsky has found (in his book Are You a Stock or a Bond?) to be more important than inflation or longevity as a threat to successfully living off a portfolio during retirement. Bottom line: This book is not the complete answer but it is well worth buying. Four out of five stars.